Yay! I’ve done something else on my List for Living. Last Sunday I presented the BBC Radio 4 programme, Pick of the Week. It was a very special moment and a privilege to have this opportunity. This is something that I’d wanted to do for years. When I returned back to Britain from being a foreign correspondent, I enjoyed doing some presenting for the BBC World Service. From time to time I’d front the World Briefing programme. I also wanted to become a presenter at Radio 4. It’s a station which I love reporting for and listening to. But when the cancer returned last year, I had to put that dream on hold. Writing my List for Living made me realise that it was something I still wanted to do. I applied to join the mentoring scheme run by the Sound Women development group for women working in radio. I was successful and the Radio 4 presenter Martha Kearney became my mentor. With her help and brilliant encouragement I started to try again. It was an incredible feeling to finally be able to present a show on Radio 4. I would really like to write more about this but I had more chemo a few days ago. I’m feeling horribly ill. It’s as if I’m in the middle of the worst ever hangover. I can barely stand up. My whole body hurts. Oh and just to make everything seem even worse, almost all my hair has fallen out. So instead of saying anything more, here is my Pick of the Week and my debut as a Radio 4 presenter! Really, what was I thinking?? Why did I want to dangle in the air, held only by a few ropes? Fly across a quarry so deep that it’s used as a diving centre? I had ages to wonder as we waited for our turn on the zip wire. I had been lulled into a false sense of security. 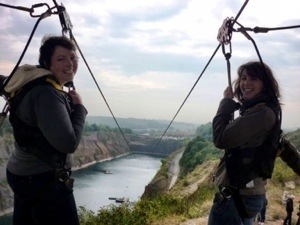 When we got to The Wire in Chepstow there was a picture of a woman doing to zip wire and she had a seat. It kinda looked like she was on a swing. Great, that’s what I’ll do. But do you think my friends would let me take the easy option? Of course not! There big of group of us. Rache, my friend who loves fancy dress, organised the day. Thankfully without any fancy outfits although she did point out to us that she’d seen a video of Batman and Robin riding the wire. 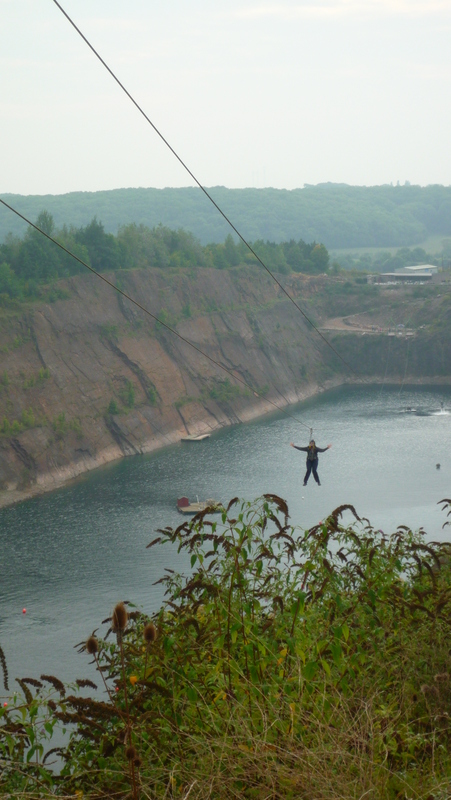 This is billed as one of the longest, tallest and fastest zip slides in the UK. It reaches speeds of up to 40 miles an hour. To get to the start of the ride you have to walk around the quarry that you will zoom over. That certainly gets your heart pumping. It makes you realise just how far you are going to go. At the top of the quarry, on the edge of the cliff, is a high platform with a ramp that you have to walk up. You have to then climb up a small stop ladder. From there the only way is down. And over the water. Very fast. I lined up with Denise, one of my oldest friends from school. We were both strapped in and petrified. She went first. I had to wait and watch as she zipped off and away. The man in charge pointed out the Severn Bridge in the misty distance. My legs were turning to jelly. Finally, it was my turn. I’d like to say I took a leap of faith. But actually it was more of a tentative step. Then whoosh. The feeling was incredible. I was flying through the air. After a few seconds of sheer terror, it felt peaceful being above the water. I loved zooming on the zip wire. Doing something like this makes you understand that fear is only a feeling. It doesn’t mean you can’t do something. What I really enjoy about doing my List for Living is that it’s such a great excuse to have fun with friends. We laughed, we screamed and we all survived. You may have heard those screams in my BBC World Service documentary, The Bucket List. If you missed it, here’s a link to the programme. Now we are looking forward to our next adventure. This time it does involve fancy dress. The thing that will be the most frightening will be what we are wearing! You’ve read about the things that I’ve done on my List for Living. Zooming down a zip wire, glass blowing and being driven fast around a race track in a sports car. Well, now you’re going to be able to hear me doing them! My radio documentary, The Bucket List, is on the BBC World Service tomorrow (Monday) at 9am and again at 8pm. I’m so excited; I can’t wait to hear it being broadcast. It’s not just my programme. 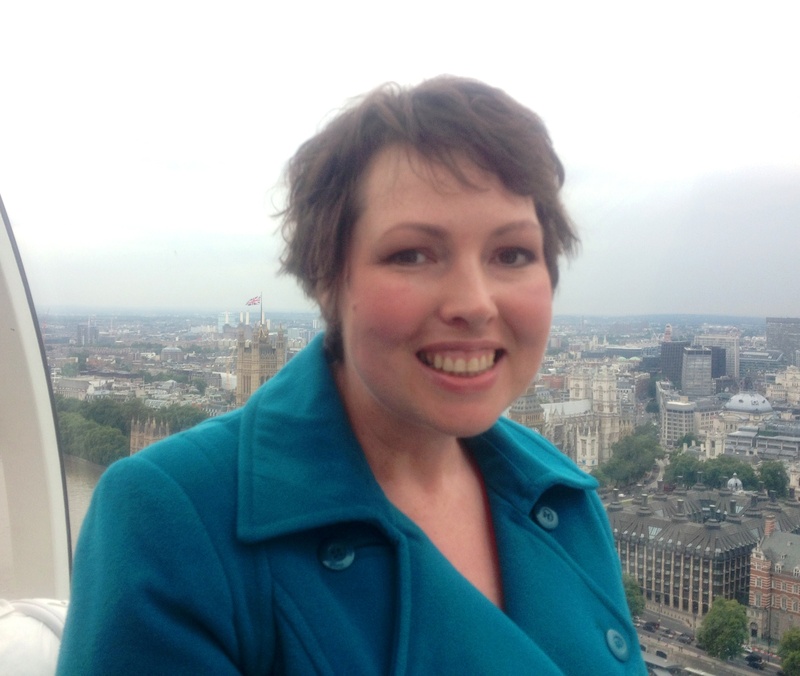 The Bucket List has been produced by Rebecca Maxted, the award winning maker of beautiful radio. I have to admit that she did all the hard work. It all started off with a chance compliment about my hair. Only I had no hair. I was wearing Raquel, my short blond wig at the time. Now, many months later, our documentary all ready to be aired. It’s about much more than just my List for Living. I interviewed some amazing people. Just a warning though, it may make you cry. Ahead of the documentary being broadcast, you may have seen an article I wrote for the BBC News magazine. If that’s how you found my blog, then a big hello and welcome along! There’s been an incredible response to the piece. So many lovely, heart-warming comments. Also I’ve had many offers of help for my List for Living including two marriage proposals! Memory is a power thing. Sometimes it’s the ability to forget that’s just as important as the stuff you remember. This is my fourth course of chemotherapy. Or to put it another way last Tuesday I had my 30th session! That seems like more than enough toxic drugs for one lifetime. Clearly not for me. It all started off in a familiar way. I had a small operation to have a new PICC line put into my arm. Just like I had last time, the PICC allows blood to be taken out and drugs to go in without having to bother my rubbish veins with a needle. It’s hard to describe what happens without being too gruesome. Basically a good vein was selected and after some local anaesthetic, a cut was made in my arm. The same vein was used as before so a tiny scar marked the spot. A thin, flexible cable went into my arm and into the vein. I’d forgotten how it was going to hurt. The chemo itself was just the same as always. For my fellow cancer fighters who may be interested, this time I’m on taxol and carboplatin. New for this season is the red coloured modesty bag to cover the plastic pouch of chemicals. The medicine that always makes me sleepy, knocked me out for chunks of the afternoon. Despite this I realised that I hadn’t remembered how the hours really drag while attached to the IV machine as litres of liquid are pumped into your veins. As it’s one session every three weeks, it’s a long day of drugs. But it wasn’t all dozing and dragging the drip to the loo. I had a visit from my friend Chantal, the flower girl and fellow glass blower. She’d gone and collected our work that we did because of my List for Living. Still bubble wrapped, she carefully placed my five pieces of glass on the bedside table. Wow I was blown away – I was really liked how they’d turned out! Also it was so good have something lovely there that wasn’t connected to my stupid disease. 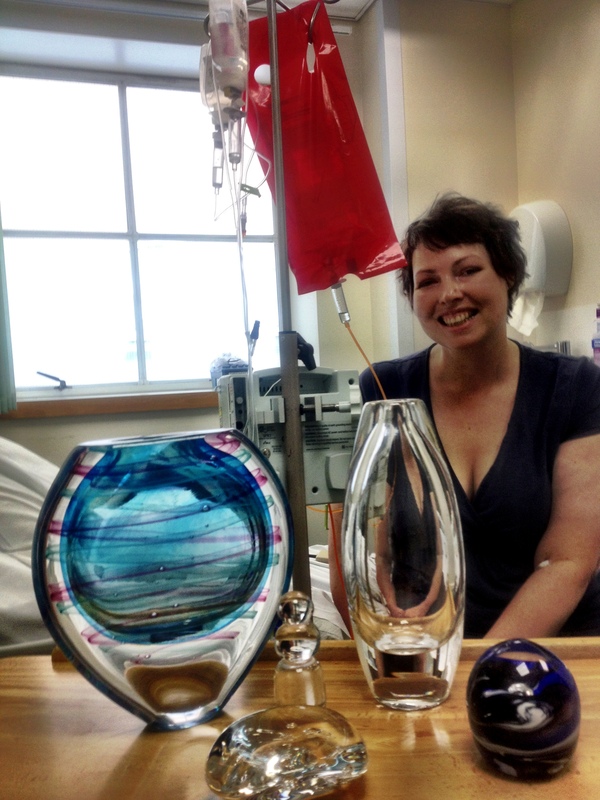 Once the drip was done and the glass was packed up, I wasn’t too ill In fact, I felt good, really good. Filled with happiness. I felt like me on a very good day. Oh yes – there’s that steroid high again. It was a brilliant surprise. What came next hasn’t been so pleasant. Chronic sickness has now been joined by fatigue, dizziness and joint pain. Uggggggh I hate it so much. I’m glad that I’d forgotten just how dreadful chemo makes you feel. At least I still have a couple more weeks before I have another toxic cocktail. I never thought this would happen so soon. I had hoped to have a cancer-free Christmas but that’s not to be. I have another tumour lurking inside me. I start another round of chemotherapy today. I’ll have it every three weeks. It’ll mean a chemo session on Christmas Eve. Of course, I knew that it was likely. When you have advanced cancer like mine you’re told to expect it to keep coming back, each time quicker than the last. My last chemo ended in May. I arranged my next check-up at the very end of August. I wanted to leave it as long as possible, but not too long, if that makes sense. In the weeks leading up to the hospital date my body was full of pain. I feared the cancer had not just come back but it had spread. What the doctors call metastasis. One of the most evil words you’ll ever hear as a patient. Two weeks before the appointment I had a blood test. It was taken after a busy day at work. I felt so alive, surely, I thought to myself I must be okay. But no. The result was bad. It was no longer the perfect ten, the score had almost doubled. There and then I had to repeat the test. When the result came back the number had doubled again. It seemed like my worst fears were coming true. Later a scan confirmed that the cancer was active again. It turns out that my new tumour is small and thin and not too far away from the last one. Along with sadness, anger and frustration there was some relief that it hadn’t spread. Apparently a lot of the pain was caused by stress and scar tissue. Now that I know what’s causing the pain, it hardly hurts at all. I don’t look like I’m ill and I don’t feel it either. This is the best I’m going to be until next spring so I’m celebrating that with a picture. After my diagnosis last Christmas Eve when I found out that my cancer had become incurable I was told to get my affairs in order which I sort of did but not really. You don’t want to think that you really have to. However now I’m more prepared. Last week I wrote my will. That was a hard day. So here we go with more chemo. Uggggh. It’s all exactly the same. It makes me want to cry being back again so soon. 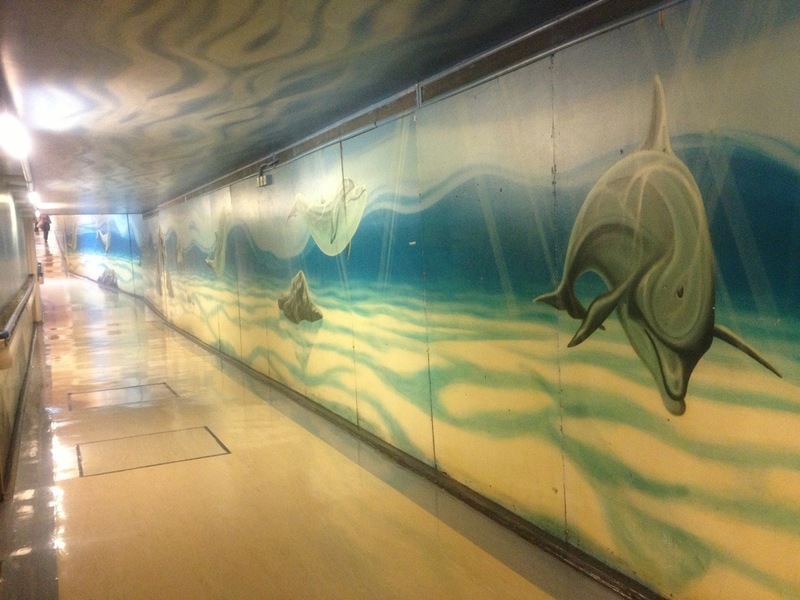 The same walk along the dolphin corridor to the treatment centre. Seeing the same lovely nurses. Sitting in the same chair. Having the same side effects for the same anti-cancer drugs. Being pumped full of the same steroids. And losing my hair once more. But I do have something very special on my side that’s making me smile and it’s not just James Bond. Along with the conventional chemo, I’m also taking part in a clinical trial. I’ll take a tablet every day which could make the chemo more effective and stabilise my cancer. It’s very exciting as the results of the trial so far are looking very good. It’s having hope that’s keeping me going and got me out of bed this morning. Now I’m just waiting for it all the begin. Stupid, stupid cancer. You have no idea how much of a kicking you’re about to get.